Bring the beauty of the Swiss forest into your workspace or studio with these beautiful, limited edition pencil sets from Caran d'Ache. Caran d'Ache Pencil Gift Sets contain pencils made from a variety of rare, exotic woods — a great gift for the sketching artist. No. 7 Exotic Woods Set — This set includes four HB graphite pencils, each made from a different exotic wood, including Polychrome Sipo, Streaked White Birch, African Assamela, and Grey Limba. The pencils are FSC-certified (certified by the Forest Stewardship Council) and OLB-certified (certifying the origin and legality of the wood). 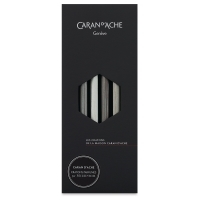 Their high-quality graphite leads are manufactured from 100% natural products. Each pencil is coated with a waterbased lacquer. 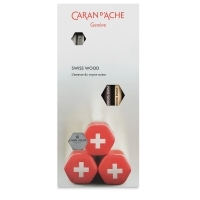 Swiss Wood Set — This set includes two HB graphite pencils, one each of pine and beech, both sourced from Swiss forests, plus an extra-soft eraser and a magnesium sharpener. The pine pencil is FSC-certified (certified by the Forest Stewardship Council), and the beech wood pencil is COBS-certified (carries a certificate of Swiss wood origin). 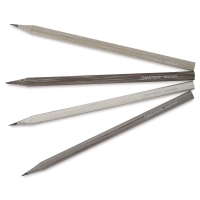 Their high-quality graphite leads are made with natural clay. 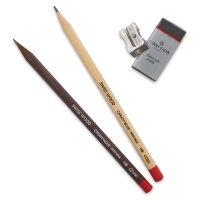 Each pencil is coated with a matte waterbased varnish.